This recipe takes a little preparation, but this crust recipe is paleo (which means it's grain free and gluten free) and it makes for a healthier pizza option, which of course makes it a bit "guilt-free". 😉 I like to prepare these pizza crusts ahead of time and keep them in the refrigerator or freezer until I'm ready to make my pizza. Once you have your crust made you can make any kind of pizza you want, but keep in mind your guests and their dietary needs (check ingredients for allergens even with toppings). **For my pizza pictured, I was really in a hurry (it happens) so I just topped my crust with organic marinara sauce, garlic, onions, and cheese. Perfectly Tasty. Hosting/Party Tip: I made my pizza that is pictured for a gathering so made it into pizza bites! All you have to do when you're ready to serve is take your pizza cutter and cut small bites. Voila! Simple as that and you have pizza bites. Have fun with this unique pizza option that most everyone can enjoy! -Mix all crust ingredients together using a spoon until the mixture becomes very thick. -Form the dough into a ball using your hands. -Lightly grease a pizza pan or a cookie sheet with grapeseed oil. -Using your hands, push and pat the dough down into the shape of a circle. -Make the dough as thin as possible. -The pizza crust should be approximately 12 inches in diameter. -Bake JUST the crust in oven for 20 minutes. -While the crust is cooking, prepare toppings. -After the crust is finished, remove it from the oven and evenly spread sauce over the crust. 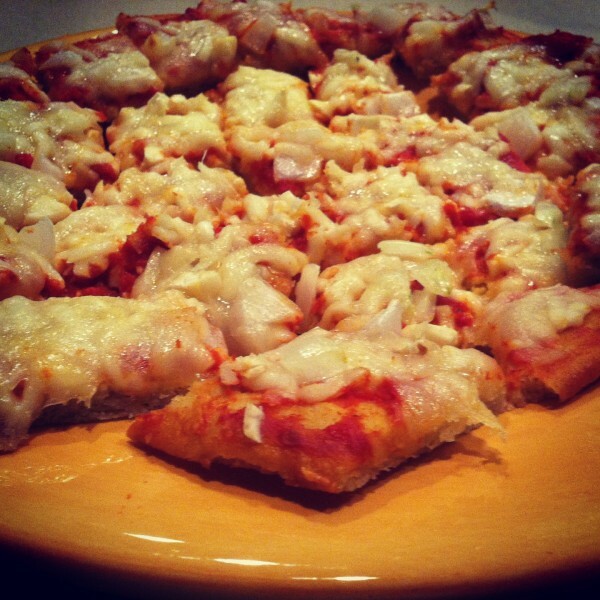 -If you’ve prepared your pizza crust ahead of time, just add toppings and bake!